Throughout the letters sent home by Ned George and Arthur, Cecil was part of the ‘home’ they had left. Because none of his letters have survived, we have to reconstruct Cecil’s wartime experience partly from what his brothers mentioned about him in their letters (in italics), and partly from the records of his Royal Navy service which do still exist (though they provide little more than dates and the names of the ships on which he served). Cecil had just turned 14 at the outbreak of the war, and at first it must have been unthinkable that he should become involved. Even Kitchener who warned the nation to prepare for an extended period of war did not foresee that hostilities would continue into a fifth year. Because of their seniority and their experience of life as soldiers which surely he would never know, the tone of his brothers’ references to him was often teasing. Cecil was continuing to live the life that they had known ─ living at home, keeping pigs, working on someone’s farm ─ on which they had deliberately (and in some respects gratefully) turned their backs. On the other hand he had now left school and was starting to experience some of the frustrations they had known as agricultural labourers, and in this more than anything else they expressed fellow-feeling. In January 1915 Etta let them know that Cecil was going to Burch’s to work ─ presumably in the butcher’s shop on the village green, or perhaps Further Hall Farm in Boulge.. Arthur seemed a bit surprised, Ned was sceptical: Tell Cecil to let Burch get someone else, which I should (21 Jan 15). But in June he was working for Gerald Smith at Great Bealings Hall. Arthur had unhappy memories: Cecil is earning good money now, so Smithy asked him about us, did he? Well, he won’t have me any more for if I get out of the army alive I shan’t work on the land if I can get any where else (3 June 15). Ned felt the same: Tell Cecil to tell Mr Smith he needn’t worry himself about me anymore because I shall not trouble him anymore, if I have the chance. But I am pleased to hear that Cecil have got there, not for the good of Gerald, but for the good of himself, the money he is getting I mean. I expect they are forced to pay more now (15 June 15). But a month later Etta evidently reported that he had moved again, to work for Hunt at Park Farm. Ned had had experience of both: Cecil have got back to Hunt’s now then, he finds the difference in the walk I expect. Hunt’s is alright if their money is alright, that’s what done me. I thought perhaps Gerald Smith had altered a bit by now, as there isn’t many men about, but I expect he still have fits. He wants to reduce his stomach a bit. 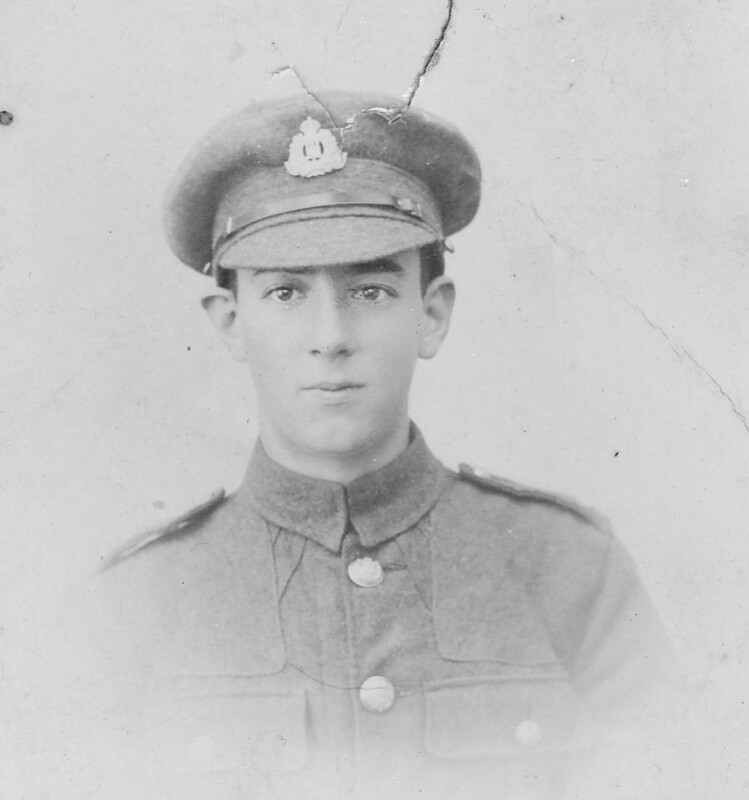 Already in the trenches, George commented from there that I should think he [Cecil] is worth 12/- a week now, as I am sure there is plenty of work about (20 July 15). At the end of the year Cecil was still with Hunt and from his hospital bed George was anxious that he was properly paid: You don’t say what Cecil’s wages are, I should think he is earning 13/- a week now on that job (22 Dec 15). But a week later, I certainly thought Cecil was getting more money than that, on a job like that, he must soon make another move. No longer just a boy, Cecil was also mixing with his brothers’ friends and former workmates and had a role as an intermediary, though the relationship was not always to his advantage. Tell Cecil to tell Mark [Marcus] Lambert I am gone to the front; Tell Cecil to tell Soldier Cook…(Arthur, 17 July 15, 10 April 15). How is Cecil getting on with harvest? Tell him to remember me to some of the men, Harry Baldry too (Arthur, 5 Sept 15). The boy Freddy Potter asked me to get him a Suffolk badge, I am sending one, it cost me fourpence, I told him it would be sixpence. I told him I would send it home, then he could ask Cecil for it, Cecil can give the sixpence to Hilda (George, 19 June 16). According to Ned, Cecil probably had a drink or two with Sutton when he was home on a weekend pass in May 1915. What Cecil and his brothers may have got up to when they were on leave we don’t know: their letters invariably say they arrived back safely at the camp but are silent on what they did or how they felt while at home..
Ned was mainly responsible for teasing his youngest brother, but clearly did so to express affection. He knew Cecil would grin when he saw the early photos of his brothers in their makeshift uniforms, and wished Cecil had been with them when they visited the aquarium in Brighton. He sent Cecil a drawing he had done while at Farnborough in June 1915 ─ we don’t know what it was of ─ and remembered his birthday. I am glad Cecil liked his card. I thought it was a very suitable [one] for the purpose. It only came into my mind by chance about his birthday. I thought I would just let him know I still knew him (13-19 July 15). Arthur was altogether less certain about it: Will Cecil be 15 or 16 the 12th of this month? I keep wondering if I should send him something, should I? Cecil had sent Arthur a fountain pen in February 1915: I thank Cecil very much for it. It is a useful present and I shall be glad of it. It was good of him to think of me (though we may suspect it was their mother who was doing a lot of the thinking). The following month there appears to have been some kind of rifle shooting event at Grundisburgh, perhaps part of a recruiting drive to what Hilda later called the ‘Grundisburgh Volunteers’, in which Cecil had evidently taken part. I should like to have seen Cecil fire the first shot, especially if he has the No. 2 Lee Enfield. I reckon if the truth is known he shut both eyes (Ned, 15 Aug 15). The only half-serious issue to arise between Cecil and his brothers was his reluctance to write to them. George eventually extracted a letter from him when he was in hospital but was less than complimentary about his young brother’s writing style, which no doubt further discouraged him. Ned failed altogether to get him to write, but added a gently chiding PS to one of his last letters: I hear very little about that poor little chap Cecil, but I am trusting he is alright and wish him a Merry Xmas (9 Dec 15). 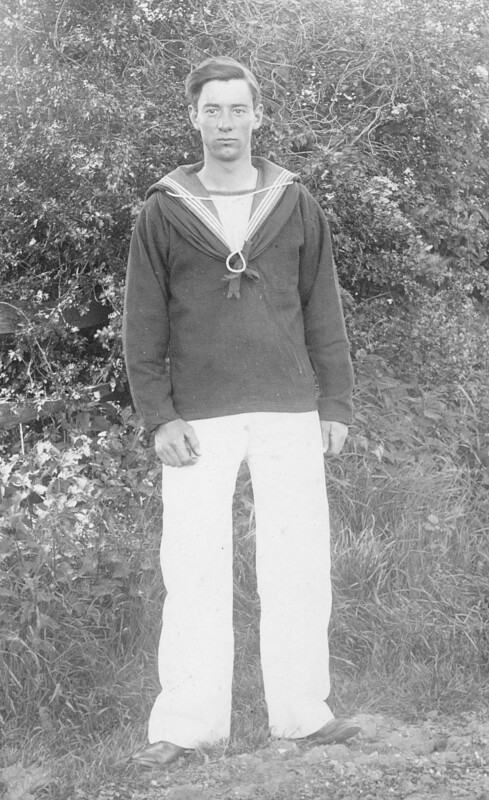 Six days after his eighteenth birthday in July 1918 Cecil was enlisted in the navy. Assuming it was his own decision to join the navy rather than the army, the choice might seem surprising given the lack of any maritime tradition in the family, but not so if he had heeded his brothers’ advice. Tell Cecil from me not to enlist, it has put years on me (George, 8 Nov 15). I hope you won’t let Cecil enlist until he is of age. He would be sorry after, the life is too rough for one so young (Arthur, 2 March 16). I recall Hilda saying that she thought he had joined the navy expecting to be demobilised promptly once the war ended. That does not seem likely as an explanation since delays in releasing men from the army as soon as the war ended were not envisaged, certainly not by the men themselves. Remembering Ned, the warnings of George and Arthur, and still with no end in sight to the war on the Western Front, choosing the navy is easily understandable. At the start of the war the numbers of naval reservists far exceeded the capacity of the navy to employ them. But with the desperate shortage of troops in France, the Royal Naval Division was formed to fight under the white ensign and with its own command structure alongside regular army divisions. Subsequently the RND was fully integrated into the BEF but retained its distinctive name. By 1918, however, the navy had first call on conscripted men who volunteered to serve with it, so Cecil could be reasonably confident of getting his choice. Naval service records were luckier than those of the army in that they survived the bombs of the Second World War. The Royal Navy Registers of Seamen’s Services in the National Archives summarises Cecil’s history between engagement on 18 July 1918 and discharge on an indecipherable date in February 1919. As Ordinary Seaman he was posted first to Royal Naval Barracks at Chatham in Kent (HMS Pembroke) where he presumably received his basic training until 24 September. He then joined HMS Commonwealth, 16,350 tons, a battleship of the King Edward VII class which was in service from 1906 until scrapped in 1921. During 1918 the ship received major reconstruction work. As with all the ships Cecil was only with Commonwealth a matter of days, until 5 October, when he returned to Chatham until 17 October. Is it possible that Cecil was with Commonwealth while she was in dock? The remaining two ships on which he served are listed in the Register as Apollo (Christopher) ─ 18 to 31 October ─ and Gibraltar (Christopher) ─ 1-28 November. HMS Apollo was a cruiser of 3,400 tons, completed in 1892 as the first of a large class of cruisers. During the war she was employed initially as a minelayer but became a depot ship in 1917 and was scrapped in 1920. HMS Gibraltar was an Edgar class cruiser, 7,700 tons, launched in 1892 and used as a depot ship from 1915 based in the Shetland Isles. HMS Christopher was an Acasta class destroyer, launched in 1912 and apparently stationed at Devonport in 1917 before being broken up in 1921. With no knowledge of the shorthand used in naval records it is impossible to do more than speculate that Cecil served on Apollo and Gibraltar while they were depot ships attached to Christopher, if that is what the bracketing of Christopher means. The Admiralty must have preserved the ships’ logs from which it should be possible to find out where the ships were during Cecil’s time with them. But it does seem that only a quarter of his brief time in the navy was spent attached to a ship, between basic training and awaiting demobilisation. When he was finally discharged the Register records that he was paid a war gratuity.